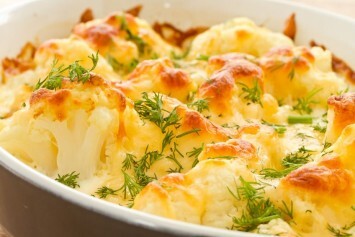 This cauliflower cheese recipe looks pretty simple, but Verna from Coalhurst, Alberta who shared it with the Cookingnook.com community calls it the best ever, so I am assuming it’s pretty good. Verna says: Each time we have a family gathering my family insists on this dish. Hope you enjoy it as much as we do. Verna didn’t give exact measurements, so I have given estimates in the ingredient list. Please note that they are estimates only. Play with it yourself to see how you like it. Steam the cauliflower for about 10-15 minutes. I like it a bit crispy. Drain and put in a 9"x9" pan sprayed with Pam. In small bowl add mayonnaise, small amount of wet mustard. Whisk until smooth. Add a little milk and whisk until you can pour it over the cauliflower. Grate cheese - I use old cheddar. Cover the cauliflower dish with lots of cheese. Put the baking dish in the oven and broil until the cheese is melted and browned. You can make this dish up in the morning and refrigerate. Put it in the oven at 350ºF for 15 minutes, then broil. Cauliflower belongs to the brassica family of foods, like broccoli and cabbage. They are all extremely healthy and great to include in our diets on a regular basis. If you like cauliflower cheese how about a broccoli cheese casserole? Find that and more delicious vegetable recipes here.